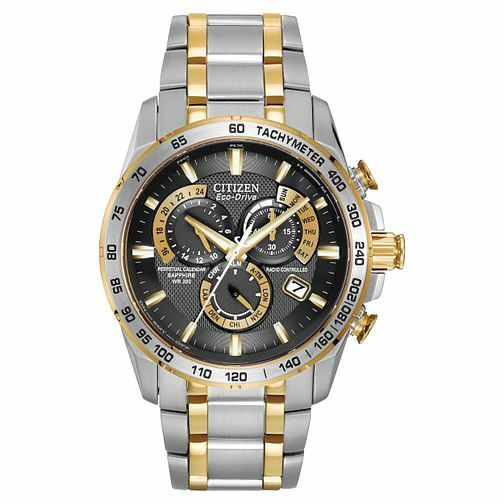 Citizen Eco-Drive two tone men's watch. The Citizen Perpetual Chrono A.T features Radio-Controlled Atomic Clock Synchronisation in 5 time zones for superior timekeeping accuracy. Powered by Citizen’s award-winning light-powered Eco-Drive technology it never needs a battery. This watch has alarm functionality. Citizen Eco-Drive Two Tone Bracelet Watch is rated 5.0 out of 5 by 4. Rated 5 out of 5 by Anonymous from Outstanding Watch This item does so much it can be tricky to figure out the functions just because it does soo much, it also looks stunning ive had this item for 7months and wear it every weekend even when working on cars the odd 2times i forgot to remove it i only notice its on when i catch it and it still doesnt have any marks, Well worth the price paid, im now a fan of Citizen and H Samuel This item should be able to be viewed instore if they are available to buy instore as it looks soo good.